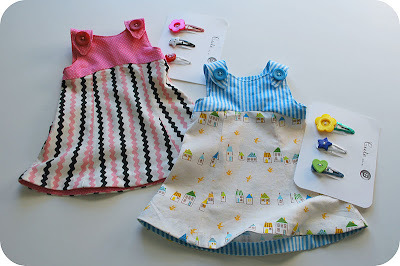 I made these two little dresses as Christmas gifts for my nieces--that is, for my nieces' dolls. A dress and a set of button barrettes for each (1 barrette for them, 2 smaller ones for their dolls). The doll's dress pattern is from Oliver + S Little Things to Sew by Liesel Gibson (love this book--but more about that later). Liesel designed this little doll dress after one of her other dress patterns for a child--and sewing it made me realize I really could set about making some actual clothes for real life people. Except for all that ironing involved with making clothing. There is way more ironing, even when making a simplified doll's dress, than when you make a plushie. And I hate ironing. Mostly because I do not do it well--I always inadvertently iron in creases (see above photo for further evidence), or never seem to really get out all the other wrinkles I am there to get out in the first place. Maybe I just need a better iron or to learn how to iron better or somewhere other than the basement in which to do my ironing--or maybe I just need to keep focusing my efforts on making toys? I love the doll dresses, they are so cute! I LOVE IRONING. If you will make the clothes, I'll do the ironing! The dresses and barrettes are adorable! And, don't let ironing scare you off of sewing clothes. I bet you need a better iron - it makes all the difference. Is it just me, or are creases caused by poor ironing WAY harder to get out than regular wrinkles. I am forever accidentally ironing over a fold or something and making impossible to get out creases! So I understand :) Clothes are fun to sew though, for little people at least. I'm scared to try and make something for myself. Crystalyn--YES, wrinkles you accidently iron in yourself are WAY harder, if not impossible, to get out it seems. Yet another reason I loathe ironing. Someone please tell me what there is to like about ironing? And any handy ironing tricks or tips are welcome. I just got this book! I love it. You did an amazing job. I agree with the ironing. I hate it too and always end up ironing in creases, too, haha. I am terrible at ironing. I have heard that steaming is easier and faster and really want to get my hands on a steamer! I love the fabric you've used, so sweet! I have discovered something strange since having my daughter- I love ironing! =/ I hate getting out the iron and putting all the clothes away, but ironing out creases in fabric seems to calm me! So cute! That pattern is on my sewing list. I absolutely LOVE that book ... one of my favorites. Leaving your iron and ironing board out and near your sewing machine helps a lot. Just think about ironing a seam after sewing it as part of the sewing process. Once you get in the habit it doesn't feel like a burden. And, it makes such a difference in what you sew. SON PRECIOSOS!!! !así como se ven...no me gusta planchar, ja!